There are many different opinions about the age at which a degu becomes fertile. 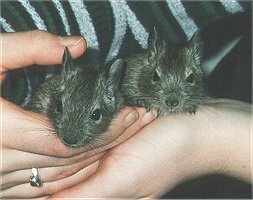 Some people say that degus become fertile at about six months, and other people say that they can be fertile at only five weeks. I'm not sure about the age at which the degus become fertile, and possibly it differs for each degu. 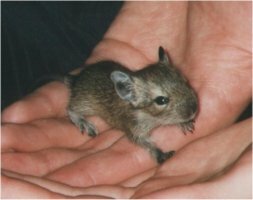 I recommend you to take into account that pretty young degu females can be impregnated. You should take your female degus away from their father and brothers at about six weeks, to prevent them from becoming pregnant. If a female degu really can be impregnated at six weeks, it doesn't seem to be desirable to me. Her body is not full-grown at that time, and she's not yet capable of taking care of babies. So always try to prevent such a young degu from becoming pregnant. You can take your degu babies away from their mother at about five or six weeks of age, but not before that time. Much in-breeding has happened with degus since they were exported from Chile. 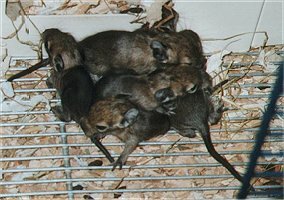 Often degu females were interbreeded with their father or brother. This caused the development of a few sensitivities that degus have (for example diabetes). If you want your degus to get healthy babies you must try to prevent in-breeding. A degu's pregnancy lasts 90 days (3 months ! ), which is a very long time for a rodent. A hamster for example has a pregnancy of only two or three weeks. New-born degus are hairy, their eyes are open, and they are pretty mobile. The first few days after birth they stay in the nest, but soon they are going to explore their environment. In a few weeks they will start eating from their parent's food, and after five or six weeks they don't need their mother's milk anymore. A degu's nest has an average of five babies, but there can also be three or even ten babies. Degus decide whether they want to mate themselves. The male degu wants to mate pretty often, but most times the female disagrees. If she disagrees she walks away and she squeeks to the male. Only once in two or three weeks the female will be ready to mate, although this differs for all degus. Right after the young degus are born the female is fertile again, but usually she is ready to be impregnated again only after the young degus are grown-up. Normally you don't have to take the degu father away from the mother and children at any time. He won't be agressive towards the babies, and he will even help the mother to take care of their kids. The mother often lies on top of her babies, in a way that they can drink milk with her, but also to keep them warm and safe. The father will also lie on top of the babies once in a while, but then the babies seem to be disappointed when their father has no milk. The parents will bring their kids back to the nest, when they are wandering around (for example when there's danger). They take their kids in their mouth, like a cat does. If you want to watch the babies lying in the nest on the days after birth, you'll see that father and mother try to cover their kids with stuff, to protect them for dangerous enemies. I'm not sure when you should take the degu babies for the first time out of the cage. In our own case, we waited until the babies came walking out of the nest on their own (this happened when they were about one week old). If you regularly take the degus in your hands, they'll get used to you and to be picked up. This way your degu babies become pretty tame (although degus will never become as tame as a hamster or guinea pig !) . You can let the degu babies wander around on your clothes, and let them explore their environment, so they get used to being out of their cage. But keep an eye on them, in case they try to gnaw at your furniture or electricity-cables! Be aware of the parents when you take the babies out of the cage. If they don't want you to take the babies, you have a chance that one of the parents will bite. If the parents are used to you, they normally won't try to stop you from taking the babies. If your degus have a nest you don't have to do much. There are only a few things you have to take into account. First, you will need to give them extra food and water. In no time, the babies will start eating their parent's food and drinking water from the bottle. As they grow, they will eat more and more. So make sure they all get enough food and water. Secondly, your degu's cage will be dirty soon when the degu family has extended. So you will have to clean the cage and the room around the cage more often. If you don't want to keep the degu babies, make sure you have a good destination for them!